Can you confirm these amateur observations of Parafimbrios lao? 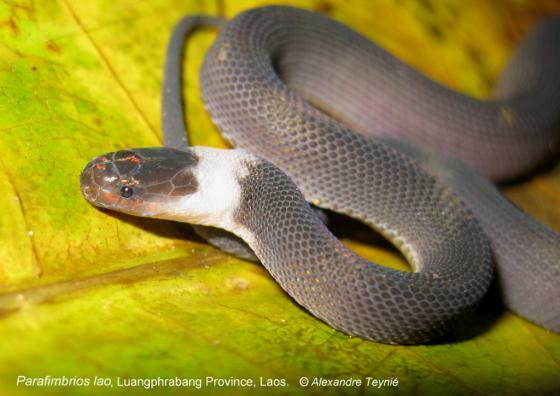 Type locality: vicinity of Muang Ngoi (20°42.005'N, 102°41.730'E; datum WGS84), Ngoi District, Louangphabang Province, Laos, at an elevation ca. 360 m.
Diagnosis Diagnosis (genus): A genus of Caenophidia, family Xenodermatidae, characterized by (1) maxillary teeth 27, progressively slightly enlarged posteriorly; (2) head not distinct from neck; (3) dorsal scales small, cycloid or subrectangular, with the correspondence of two dorsal scale rows per ventral plate throughout the body; (4) two consecutive scales of the first dorsal scale row enlarged; (5) rostral separated from internasals by a fold of skin, larger on the sides than above the middle of the rostral; (6) nostril piercing the anterior part of a large, concave nasal; (7) mental and both anterior supralabials and infralabials with strong, raised, everted edges; (8) eye with vertically elliptic pupil; (9) loreal single, large, extending from nasal to eye; (10) chin shields in a single pair, enlarged; (11) body moderately elongate; (12) ventrals large, rounded; (13) subcaudals undivided; (14) cloacal plate entire; and (15) hemipenis short, forked, distal half strongly spinose. Although Parafimbrios gen. nov. shares morphological similarities with other members of the family Xenodermatidae, it is morphologically most similar to Fimbrios. Parafimbrios gen. nov. differs from Fimbrios by a combination of the five characters listed above, the most important being (1) the correspondence of two consecutive dorsal scale rows per ventral plate throughout the body, (2) fewer dorsal scale rows, and (3) posterior teeth progressively and slightly enlarged (vs. equal). Additional comparisons between the new genus and species and members of the genus Fimbrios are given below in the species description. Comparisons. The genus Parafimbrios can be distinguished from all genera of Xenodermatidae, at the partial exception of Fimbrios, by a series of diagnostic characters at the generic level given above in the introduction to its description. The combination of (1) 2 dorsal scale rows above each ventral; (2) dorsal scale rows very small, uniform in shape; (3) supralabials and infralabials with strongly everted edges; (4) 27 maxillary teeth; and (5) 25–27 dorsal scale rows at midbody, is sufficient to distinguish this species from members of the genera Xenodermus, Stoliczkia, Achalinus, and Xylophis. 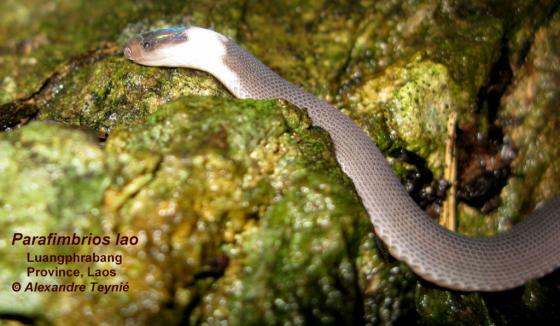 Furthermore, the relatively slender body of Parafimbrios lao spec. nov. is closer to the habitus of members of the genus Achalinus than of Fimbrios but much less slender than the habitus of Xenodermus and Stoliczkia. However, Parafimbrios lao spec. nov. readily differs from all the species currently included in the genus Achalinus by its much more strongly erected ridges on labial scales, which are barely or not erected in Achalinus. Parafimbrios lao spec. nov. shares several similarities with the two species of the genus Fimbrios currently recognized, F. klossi (Figs. 5C & 6A) and F. smithi (Fig. 5D in Teynié et al. 2015). According to Smith (1921, 1943), Campden-Main (1970), Orlov et al. (2003), Ziegler et al. (2008) and our own data, Parafimbrios lao spec. nov. differs from both species of the genus Fimbrios by (1) a more slender body, (2) fewer maxillary teeth (27 vs. at least 30), (3) only 25 or 27 DSR at midbody vs. at least 30, (4) 2 dorsal scale rows per ventral plate vs. one, (5) a shorter tail with a ratio of Tal/TL of 0.156–0.172 vs. 0.185–0.197 in males of F. klossi and 0.214 in the single known male of F. smithi, (6) and by the pale creamish-grey nuchal collar, vs. no pattern in F. klossi and only pale blotches and stripes in the neck region in F. smithi. Furthermore, Parafimbrios lao spec. nov. has more ventrals than in F. klossi, (177–189 vs. 161–176 in F. klossi) but fewer than in F. smithi (193 VEN). Bourret (1937) mentioned a specimen of F. klossi (M. 558) with 190 ventral scales, a value reported by Campden-Main (1970). This specimen was not examined but we suspect that it might belong either to F. smithi or to another undescribed species. Bourret (1937) emphasized the unusually high ventral scale count of that specimen but did not mention any other difference compared with F. klossi. He counted 53 subcaudals in this specimen that, furthermore, had a bluish-grey dorsum, 315 mm total length, and a tail length / total length ratio of 0.16. All other known specimens of F. klossi have less than 180 ventrals. Parafimbrios lao spec. nov. also differs from F. klossi in having only the first 3 or 4 infralabials with raised edges vs. first 7 infralabials in F. klossi. Lastly, Parafimbrios lao spec. nov. differs from F. smithi by having (1) fewer subcaudals (55–56 vs. 72 in F. smithi), (2) suture between internasals shorter than that between prefrontals (character shared with F. klossi) vs. distinctly longer in F. smithi, (3) 1 subocular vs. 2, and (4) 3 posterior temporals vs. 5. Diagnosis. A species of the genus Parafimbrios gen. nov., defined by a combination of generic characters listed above plus (1) dorsal scale rows 27–29 – 25–27 – 23–25, distinctly keeled, small, cycloid, progressively larger on the top of the body than on the sides; (2) scales of the first DSR distinctly enlarged, also two per ventral, first smallest, last largest; (3) ventrals 177–189, large, laterally rounded; (4) subcaudals 55–56, undivided; (5) 1st–4th or 1st–5th supralabials, mental, and 2nd–4th infralabials with raised and everted edges; (6) suture between the internasals 0.7 times as long as suture between the prefrontals; (7) 1 / 1 (upper) preocular, 1 / 1 supraocular, 2 / 2 postoculars, and 1 / 1 subocular; (8) 1 / 1 loreal, large; (9) nuchal scales 3, one in central and one enlarged on each side; (10) dorsum dark purplish-grey, slightly paler on the sides; and (11) neck with a pale creamish-grey collar, more or less pronounced with age, reaching downwards the pale grey colour of the venter. 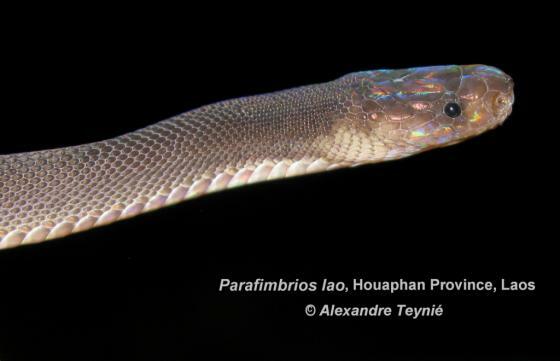 Comment Type species: is the type species of the genus Parafimbrios TEYNIÉ, DAVID, LOTTIER, LE, VIDAL & NGUYEN 2015. Habitat: rocky evergreen forest, with some remaining trees of primary forest, surrounding a rugged karst formation. Etymology The generic nomen Parafimbrios is composed of the modern Latin generic nomen Fimbrios and the Latin adjective par (paris), meaning, among other possibilities, “similar to”. The nomen Fimbrios itself stems from the Latin noun fimbria (-ae), meaning “a fringe”, by allusion to the edges of labial scales producing a kind of fringe around the snout. So, the generic nomen Parafimbrios refers to one of the diagnostic characters of Fimbrios, to which Parafimbrios gen. nov. is morphologically quite similar but taxonomically distinct. The specific epithet, lao, refers both to the official name of Laos, the Lao People’s Democratic Republic in which the species was discovered, and to the Lao, the main people group inhabiting Laos.